Welcome to my new website, I hope you like it! This has been a wee while in the works but I am really happy with how it looks. I want to serve a few purposes with this new website – obviously it’s set up for our coaching business but I want to start doing a bit of blogging where I discuss certain things in the cycling world and also share our riders results and what they have been up to, because many of our athletes are doing great things nationally. The overall level at both elite and age group track nationals this year was the highest I have ever seen it. 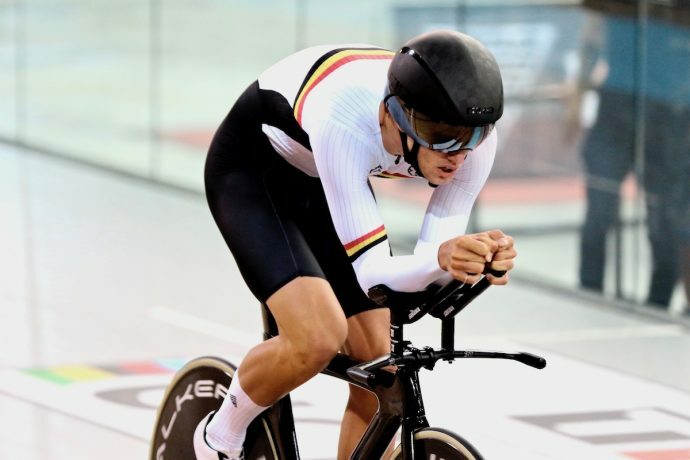 In the individual pursuit there was five riders that went sub 4:20 in the elite men, four riders went 3:20 or quicker in the U19 men and four riders went sub 2:20 in the U17 boys too – this has never happened before. In general you may get one rider in all age groups go sub 20, but having so many really shows how high the level is on the track in New Zealand. It wasn’t that long ago that U17 boys title was won in a 2:23 so to think it was just won in 2:13 is mind boggling. On top of all this national records went to Hamish Bond (elite), Finn Fisher Black (U19), Jack Carswell (U17B) and Jenna Borthwick (U17G). The national record that Finn got, was also a world record. It was impressive being at both competitions and seeing Finn break the world record twice in the space of a few hours was a huge highlight. Another big stand out for me was Jenna Borthwick who won (I think) 5 golds in the U17 girls and a heap of records along the way. Like I said, the level was very high this year! Penny Pawson won golds in the pursuit, scratch race and the points race. Lachie Dickson won a gutsy silver in the scratch race and fourth in the pursuit. As a result of a strong nationals Lachie has been named in the New Zealand team for junior world champs later in the year. Prue Fowler yet again showed her class. One week before nationals she was knocked off her bike fracturing a finger but still went on to win Gold in the points race and a silver in the pursuit behind Jenna. Mitch Fitzsimmons had a very solid nationals in what was an uber competitive U17 boys grade. Mitch got bronze in the pursuit, silver in the 500m, silver in the scratch race and silver in the team pursuit. Finn Fisher Black won the U19 pursuit and then went on to ride the elite team pursuit in the Waikato team and become the first centre team ever to break the 4min barrier over 4km. Finn has also been named in the junior worlds squad alongside Lachie later in the year. Andy Parker won gold in the time trial and silver in the pursuit. Peter Ashworth won a very impressive gold in the pursuit beating Andy. Johnathan Leonard won gold in the pursuit. Neil Familton broke the NZ record on the way to gold in the pursuit, and another gold in the scratch race to cap off an amazing nationals for him. We had a large number of other riders also bringing home medals. Paul Kircher, Mikaela Grant, Micheal Audeau, Sophie de Vries, Ethan Titheridge, Griffyn Spencer, Navarh Brotherston, Morgan Borrie and Ryan Macleod all won medals too and had very good nationals. Of course we had riders that didn’t quite perform to the level they were hoping but that is the beauty of this sport and sport in general – it doesn’t always go your way and as hard as it is at the time it serves as big motivation in the future. We had many riders do some impressive PB’s though, and although medalling or winning is often the goal, coming away from nationals with a PB means you got it all out on the day and that’s something to be proud of. Overall it was a really great nationals for all us coaches with more learning too. On another note we had both Henrietta Christie and again Finn Fisher Black bringing home medals at the Oceania Champs last month in Australia. Henrietta won a very impressive bronze in the Oceania U19 time trial as a first year U19 and Finn won both the time trial and the road race to cap a super impressive early part of the year for him. Last week at the Australian track nationals we had Hamish Wright winning gold in the M3 sprint and a bronze in the time trial to cap a great weekend of racing for him in a very competitive Aussie scene. Next up for our athletes is the age group road nationals in Timaru, so everyone is in full training mode getting ready for that. Funnily enough it’s the same course I won national titles on way back in 1997 where I took gold in both the time trial and also the road race. It’ll be interesting to see the course again, I remember the climbs back then being “massive” and way too long. Mind you I haven’t been riding much lately so they are probably harder than they were back then. It would be great if any of our athletes can do the double down there in what will be another high level competition. Forgive me if I’ve left athletes out. This website and blog was meant to be done months ago but life got in the way!